A new release from Rosal, this is the Tueur line of corsets for waist and neck, in leather and latex, with or without OpenCollar.. whew! We visited Tsarina’s new store, a cool little skybox that she is feverishly working on filling up with great new designs like this one. The large grain on the leather corset reminded me of Alien Leather by Brushed Reality, and sure enough, they go really well together. The prim work is excellent, and the level of detail is incredible (zoom in on the buckles if you get the leather one!). Even the cool little fleur-de-lys design on the front is awesomely detailed. You get 4 options with the Tueur corsets, leather or latex (guess who's wearing what) and if you want them with open collar script in them. 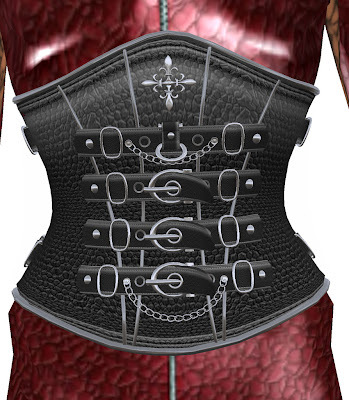 The details are great on these, no surprise there, look at the buckles on both corsets, those are a piece of art. In the menu you can turn the corset animations on and off, for walking and normal poses, though i’m sure the real corsets lovers have their own special picked AO to over come this problem. You can also hide the laces or color them red, pink, black, brown and white. The V2 users can hide the invisiprims, and use one of the included alpha layers, which come in normal or short and you also get the textures so you can add them to your boot tattoo layer.